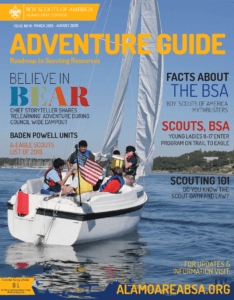 Ellie Morrison is the 11th national commissioner of the BSA — a position first held by Daniel Carter Beard, one of the founders of Scouting in the United States. She is the first woman to serve in the role. Like commissioners at all levels of Scouting, the national commissioner is an experienced Scouter who helps chartered organizations and unit leaders achieve the aims of Scouting. Ellie’s impact on Scouting has been felt in many ways. She chaired the New Unit Task Force, which is a collaboration of membership and commissioner service charged with creating a best-practices guide to organizing new Scouting units. Ellie was also a key member of the committee 20 years ago that designed the BSA’s Wood Badge for the 21st Century — a complete revamp of Scouting’s adult leadership training program that was first delivered in the U.S. in 1936 after being introduced globally in 1919. Her efforts to promote the New Member Coordinator position, including serving as the first chair of the New Member Coordinator Task Force, have helped new Scouting families feel welcomed into Scouting. In 2013, Ellie received the Silver Buffalo Award — the highest commendation given by the BSA for extraordinary service to youth. She has served as Council Commissioner and the Vice President of Membership in the Longhorn Council. She also served as an Area Commissioner twice. She has been part of the National Commissioner Service Team for the last 10 years which, until her new position, was serving as the Chairman of the Team. She is active as an assistant Scoutmaster for Troop 308 in Waco, Texas, and continues to serve as a unit commissioner. Outside of Scouting, Ellie serves on a number of local boards including United Way, Baylor Research, Oakwood Cemetery, and McLennan County Community College Foundation. She is currently the Volunteer Coordinator for Food for Families in the Waco area. They collected 1.2 million pounds of food in one day. She has also served in the First United Methodist Church in Waco as director of Christian education and children’s ministries. Ellie follows recent national commissioners Charles W. Dahlquist II (2016-2018) and Hector A. “Tico” Perez (2008-2016).